"Moog Coil Springs --. Notes 4-Door, 4WD, Constant Rate Springs, With A/C, Location : Front. Notes : Constant rate springs. Quantity sold : Set of 2. Location : Front. Therefore all implied warranties that may apply to your part are limited to the duration of this written warranty. Trending at $22.38eBay determines this price through a machine learned model of the product's sale prices within the last 90 days. "Moog Coil Springs --. Notes : Constant rate springs; 5.6 in. spring rate; 821 lbs. load; 8 in. installation height; 12.11 in. free height; End Type 1 - Pigtail; End Type 2 - Pigtail. Quantity sold : Set of 2. Trending at $75.95eBay determines this price through a machine learned model of the product's sale prices within the last 90 days. 2010 Jeep Wrangler 4WD; Unlimited Mountain; Unlimited Rubicon; Unlimited Sahara; Unlimited Sport; Unlimited X; Air Conditioning. 2009 Jeep Wrangler 4WD; Unlimited Rubicon; Unlimited Sahara; Unlimited X; Air Conditioning. This Moog Coil Spring Set fits your 2006 2005 2004 2003 2002 Jeep Wrangler 4.0L L6 and is perfect for a tune up or performance upgrade. 2005 Jeep Wrangler 4.0L L6;Rubicon Sport Utility 2-Door;GAS;OHV;Naturally Aspirated;Rear;Constant Rate Spring;Rubicon. 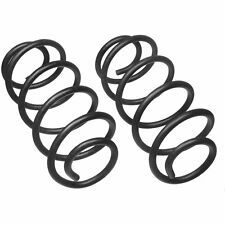 This Moog Coil Spring Set fits your 2006 2005 2004 2003 2002 2001 2000 1999 1998 1997 Jeep Wrangler 2.4L 2.5L 4.0L L4 L6 and is perfect for a tune up or performance upgrade. 2004 Jeep Wrangler 4.0L L6;Sport Sport Utility 2-Door;GAS;OHV;Naturally Aspirated;Rear;Constant Rate Spring;Sport;Standard Trans;Transmission. This Moog Coil Spring Set fits your 2006 2005 2004 2003 Jeep Wrangler 4.0L L6 and is perfect for a tune up or performance upgrade. 2006 Jeep Wrangler 4.0L L6;X Sport Utility 2-Door;GAS;OHV;Naturally Aspirated;Front;Air Conditioning;Constant Rate Spring;X;Automatic Trans;Transmission. 1997 Jeep Wrangler Sport 4.0L 6 Cyl. 1997 Jeep Wrangler Sahara 4.0L 6 Cyl. 1998 Jeep Wrangler Sport 4.0L 6 Cyl. 1998 Jeep Wrangler Sahara 4.0L 6 Cyl. 1999 Jeep Wrangler Sport 4.0L 6 Cyl. 1999 Jeep Wrangler Sahara 4.0L 6 Cyl. 2010 Jeep Wrangler 4WD; Unlimited Mountain; Unlimited Rubicon; Unlimited Sahara; Unlimited Sport; Unlimited X. 2009 Jeep Wrangler 4WD; Unlimited Rubicon; Unlimited Sahara; Unlimited X. Coil Springs have three types of ends: Square, Tangential and Pigtail. 2010 Jeep Wrangler Islander; Rubicon; Sahara; Sport; X Model. Coil Springs have three types of ends: Square, Tangential and Pigtail. It is important that you select a coil spring that matches BOTH your end types, otherwise the coil spring won't fit.